I am seeking player input on the rewrite of these rules. I'm hoping the rules are clearer and easier to understand. Please leave feedback! 1. Every primary server build shall have a 700 block radius zone in which region creation and plot purchase is not permitted. This means no new regions may be established and no additional plots may be placed within 700 blocks of any protected block in a primary server build (1000 for spawn). Regions that are in place before the server build is put in place may be within the 700 block radius. Primary server builds include but are not limited to spawn and the Sisterhood Temple. Please refer to the map below to see the location of these builds. Keep in mind, there may be primary server builds not included on the map. The best way to find out whether you can claim a region in your desired location is to ask a staff member. 2. Every standalone region shall have a no-claim radius or sphere of influence, the size of which is determined by the number of plots in the region. Only the region Owner or someone who has permission from the region Owner may found a region or buy plots within another region's no-claim radius. 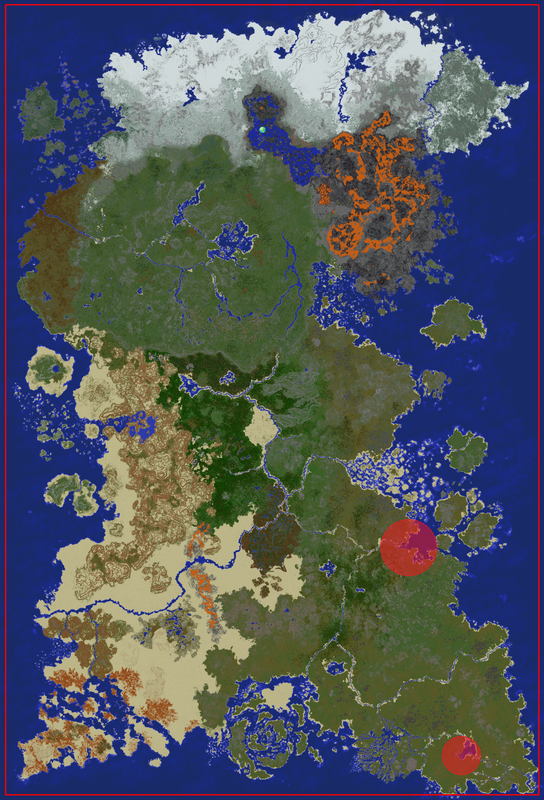 Under this, a 1 plot region will have a no-claim radius of 101 blocks. A 317 plot region will have a 417 block no-claim zone radius, and a 967 plot region will have a 700 block no claim zone radius. The bare minimum is thus 101 and the max 700. 3. Allied regions in close proximity shall have a compounded no-claim radius or sphere of influence. Allied regions need not be owned by the same Owner, but ought to be controlled IC by one entity. In addition, there ought to be an OOC agreement in place to keep the regions allied. Players may not, without all respective Owners' permission, create a region in an area that is encapsulated or nearly encapsulated by several allied spheres of influence. In the below picture, one cannot claim in the space between the circles without permission. Disclaimer: Staff is not responsible for inner roleplay skirmishes and battles within the Allied Regions that lead to requests on WEing one region away from the other. Be sure to check with the Owners around your possible new region to see if you're accidentally sitting in their No-Build sphere of influence. 4. Rival regions in close proximity shall create a no-claim zone in the space it encapsulates or nearly encapsulates. Players may not create regions in said space without permission from all relevant Owners. 5. If a player unintentionally settles a region in a no-claim zone, said player may have the region and builds moved to a staff approved location. The player must then work with staff to select a proper location. This is only allowed once per player. Subsequent infringements shall result in region and build removal with no refund. If you have questions or you would like help finding a place to start your region, please contact a staff member or post below. Did you mean Pantheon or Grand Shrines? Didn't we have something like this before that reached around 500 blocks approx around builds? What happens if two hamlets are near each other (but seemingly far away, as small huts go) but both expand into large cities? I would figure the players in question would have something planned out in that case, but what would happen here? Interestingly to note, when this happened in the real world the two locations would merge (or one would assimilate the other)... but I'm guessing most players wouldn't be too happy about losing their settlement due to proximity. Would staff intervene in this case? Danke, and it is looking gud. That's only if they don't have permission from each other to build closer. Hopefully the two owners would be able to work out a solution that doesn't involve invoking the empty space thing Sally's talking about here. How much does it cost to buy a new region?